This week: San Francisco checks in with dance legend Anna Halprin!!! Anna Halprin (b. 1920) is a pioneering dancer and choreographer of the post-modern dance movement. 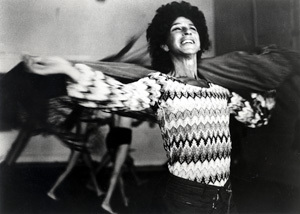 She founded the San Francisco Dancer’s Workshop in 1955 as a center for movement training, artistic experimentation, and public participatory events open to the local community. Halprin has created 150 full-length dance theater works and is the recipient of numerous awards including the 1997 Samuel H. Scripps Award for Lifetime Achievement in Modern Dance from the American Dance Festival. Her students include Meredith Monk, Trisha Brown, Yvonne Rainer, Simone Forti, Ruth Emmerson, Sally Gross, and many others. Printed Matter, Inc, the New York-based non-profit organization committed to the dissemination and appreciation of publications made by artists, will host a Benefit Auction and Selling Exhibition at the Rauschenberg Foundation Project Space to help mitigate damage caused by Hurricane Sandy. As a result of the storm, Printed Matter experienced six feet of flooding to its basement storage and lost upwards of 9,000 books, hundreds of artworks and equipment. Printed Matter’s Archive, which has been collected since the organization’s founding in 1976 and serves as an important record of its history and the field of artists books as a whole, was also severely damaged. Moreover, the damage sustained by Sandy has made it clear that Printed Matter needs to undertake an urgent capacity-building effort to establish a durable foundation for its mission and services into the future. This is the first fundraising initiative of this scale to be undertaken by the organization in many years, and will feature more than 120 works generously donated from artists and supporters of Printed Matter. The Sandy Relief Benefit for Printed Matter will be held at the Rauschenberg Project Space in Chelsea and will run from February 28 through March 9th. The Benefit has two components: a selling exhibition of rare historical publications and other donated works and an Auction of donated artworks. A special preview and reception will be held February 28th, 6-8 pm, to mark the unveiling of all 120 works and to thank the participating artists and donors. The opening will feature a solo performance by cellistÂ Julia KentÂ (Antony and the Johnsons), followed by a shared DJ set fromÂ Lizzi BougatsosÂ (Gang Gang Dance) &Â Kyp MaloneÂ (TV on the Radio). The event is free and open to the public. All works will then be available for viewing at the Rauschenberg Project Space March 1 â€“ March 9, gallery hours. All Selling Exhibition works may be purchased during this period and Auction works will be available for bidding online. Bids can be made atÂ www.paddle8.com/auctions/printedmatter. A live Benefit Auction Event will take place March 9, 6-8:30 pm with approximately 20 selected works to be auctioned in a live format. Bidding on these works will commence at 7pm sharp, while silent bids can be made on all other Auction works. Note, highest online bids will be transferred to the room. For absentee bidding of works, please contact Keith Gray (Printed Matter) at 212 925 0325 orÂ keith@printedmatter.org. The evening will feature a performance byÂ Alex WatermanÂ on solo cello with electronics. Admission is $150 and tickets may be pre-purchasedÂ here. There will be only limited capacity. Highlighted auction works include an oversize ektacolor photograph fromÂ Richard Prince, a woven canvas piece fromÂ Tauba Auerbach, an acrylic and newsprint work fromÂ Rirkrit Tiravanija, a large-scale Canopy painting fromÂ Fredrik VÃ¦rslev, a rare dye transfer print fromÂ Zoe Leonard, a light box byÂ Alfredo Jaar, a book painting byÂ Paul Chan, a carbon on paper work fromÂ Frances Stark, a seven-panel plexi-work with spraypainted newsprint fromÂ Kerstin BrÃ¤tsch, a C-print from Hans Haacke, a firefly drawing fromÂ Philippe Parreno, a mixed-media NASA wall-piece fromÂ Tom Sachs, a unique print fromÂ Rachel Harrison, a vintage xerox poem fromÂ Carl Andre, an encyclopedia set of hand-made books fromÂ Josh Smith, a photograph fromÂ Klara Liden, a table-top sculpture fromÂ Carol Bove,Â Ed Ruschaâ€™s Rooftops Portfolio, as well as original works on canvas and linen byÂ Cecily Brown,Â Cheyney Thompson,Â Dan Colen,Â Adam McEwen,Â RH Quaytman, and many others. In addition to auction works, a vitrine-based exhibition of rare books, artworks and ephemera are available for viewing and purchase. This material includes some truly remarkable items from the personal collection of Robert Rauschenberg, donated by theRobert Rauschenberg FoundationÂ in memory of the late Printed Matter Board Member, bookseller and publisher, John McWhinnie. Among the works available are books and artworks fromÂ Marcel Duchamp,Â Willem de Kooning,Â Alfred Steiglitz,Joseph Beuys,Â Brigid Berlin (Polk), as well as aÂ Claes OldenburgÂ sculpture, a rareÂ William BurroughsÂ manuscript, and the Anthology Film Archive Portfolio (1982). Additional artistsâ€™ books have been generously donated by theÂ Sol LeWitt Estate. Works include pristine copies of Autobiography (1980), Four Basic Kinds of Straight Lines (1969), Incomplete Open Cubes (1974), and others.Â Three Star BooksÂ have kindly donated a deluxe set of their Maurizio Cattelan book edition. These works can be viewed and purchased at the space. For inquiries about available works please contact Printed Matterâ€™s Associate Director Max Schumann at 212 925 0325 orÂ mschumann@printedmatter.org. Co-chairs Ethan Wagner & Thea Westreich Wagner and Phil Aarons & Shelley Fox Aarons have guided the event, and Thea Westreich Art Advisory Services has generously lent its expertise and assisted in the production of the auction. Michele Abeles, Ricci Albenda, Carl Andre, Cory Arcangel, Assume Vivid Astro Focus, Tauba Auerbach, Trisha Baga, John Baldessari, Sebastian Black, Mark Borthwick, Carol Bove, Kerstin BrÃ¤tsch, Sascha Braunig, Olaf Breuning, Cecily Brown, Sophie Calle, Robin Cameron, Sean Joseph Patrick Carney, Nathan Carter, Paul Chan, Dan Colen, David Kennedy Cutler, Liz Deschenes, Mark Dion, Shannon Ebner, Edie Fake, Matias Faldbakken, Dan Graham, Robert Greene, Hans Haacke, Marc Handelman, Rachel Harrison, Jesse Hlebo, Carsten HÃ¶ller, David Horvitz, Marc Hundley, Alfredo Jaar, Chris Johanson, Terence Koh, Joseph Kosuth, Louise Lawler, Pierre Le Hors, Leigh Ledare, Zoe Leonard, Sam Lewitt, Klara Liden, Peter Liversidge, Charles Long, Mary Lum, Noah Lyon, McDermott & McGough, Adam McEwen, Ryan McNamara, Christian Marclay, Ari Marcopoulos, Gordon Matta-Clark, Wes Mills, Jonathan Monk, Rick Myers, Laurel Nakadate, Olaf Nicolai, Adam O’Reilly, Philippe Parreno, Jack Pierson, Richard Prince, RH Quaytman, Eileen Quinlan, Sara Greenberger Rafferty, Ed Ruscha, Tom Sachs, David Sandlin, Paul Mpagi Sepuya, Cindy Sherman, Josh Smith, Keith Smith, Buzz Spector, Frances Stark, Emily Sundblad, Andrew Sutherland, Peter Sutherland, Sarah Sze, Panayiotis Terzis, Cheyney Thompson, Rirkrit Tiravanija, Nicola Tyson, Penelope Umbrico, Fredrik VÃ¦rslev, Visitor, Danh Vo, Dan Walsh and Ofer Wolberger. Rocks. Knots. Lemons. A Conversation with Lisa Radon.